How’s Murphy’s comeback during the 11th season of the Murphy Brown TV show on CBS? As we all know, the Nielsen ratings typically play a big role in determining whether a TV show like Murphy Brown is cancelled or renewed for season 12. Unfortunately, most of us do not live in Nielsen households. Because many viewers feel frustration when their viewing habits and opinions aren’t considered, we’d like to offer you the chance to rate all of the Murphy Brown season 11 episodes here. 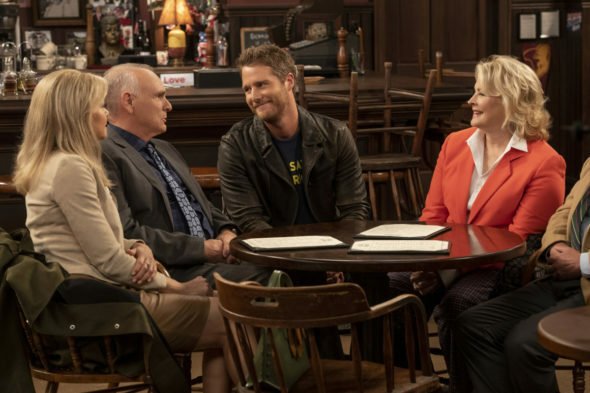 A CBS sitcom revival, Murphy Brown stars original cast members Candice Bergen, Grant Shaud, Faith Ford, and Joe Regalbuto, alongside Nik Dodani, Jake McDorman, Adan Rocha. and Tyne Daly. Amidst daily attacks on the press, Murphy Brown (Bergen) decides to forsake retirement for a new CNC morning show, Murphy in the Morning. She reunites the old FYI gang, Corky Sherwood (Ford), Frank Fontana (Regalbuto), and Miles Silverberg (Shaud) for her new endeavor, as well as social media director Pat Patel (Dodani), and is determined to prioritize solid reporting over sensationalism. They still decompress at Phil’s bar, which is now run by his sister, Phyllis (Daly), with help from college student, Miguel (Rocha), a “Dreamer” from Mexico. Meanwhile, Murphy’s son, Avery (McDorman), is all grown up and following a bit too closely in mom’s footsteps. What do you think? Which season 11 episodes of the Murphy Brown TV series do you rate as wonderful, terrible, or somewhere between? Should CBS cancel or renew Murphy Brown for a 12th season? Don’t forget to vote, and share your thoughts, below. More about: Murphy Brown, Murphy Brown: canceled or renewed? The only thing I see that needs correcting for the new Murphy Brown series is to only “remember/ reminisce about the “old” days of the eighties (lol that’s not that long ago in my mind anyway), but continue to act as hungry reporters from before. They have lost their “fire” probably because of all this politically correct crap. Come on, be passionate and outspoken. Being politically correct is NOT funny! A fantastic, funny show! Very appropriate for today! I love murphy brown. It makes me laugh and think. I watched the original show and love this one too. All the characters are funny and I love avery. Everyone on the show is fantastic! Kudos to Diane English. America needs “Murphy Brown” now more than ever. Please bring back the show and release all original and latest episodes on DVD. These comments read like they were written by the cast and crew of the show! This show is so poorly written and acted it makes Last Man Standing look Emmy worthy. Can’t blame it on their age because they’re killing it over on The Cool Kids. I can’t believe I would agree with Trump about anything but this show does not deserve another season. Season 11 should be erased so as to not tarnish the fond memories of the original run.